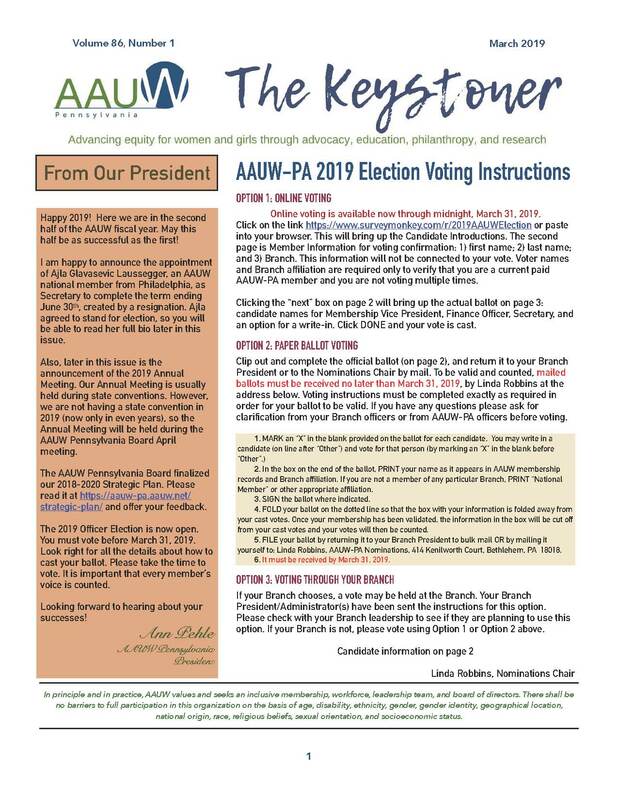 AAUW believes that high-quality public education is the foundation of a democratic society and the key to economic prosperity and gender equality. We advocate equitable climates free of harassment, bullying, and sexual assault. We support academic freedom, civic education, protection from censorship, bias-free education, and responsible funding for all levels of education, including early childhood education and programs for students with disabilities. Adequate and equitable funding for quality public education for all students. Growing up in the right zip code in Pennsylvania can change a student’s entire educational experience. With one of widest gaps between the highest and lowest spending school districts of any state in the country, our students and educators are experiencing inequity at outrageous and damaging levels. 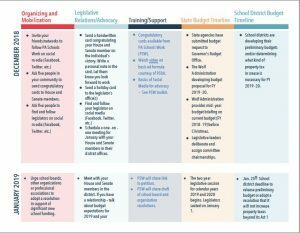 The disparity in spending is so wide that the most well-off districts spend about $114,000 more per classroom than those with the lowest spending districts. Pennsylvania ranks 46th in the nation for its share of education funding. Almost dead last. That means 429 of its 500 school districts – serving 1.4 million students – do not receive their fair share of state education funding. Students aren’t the only ones paying the price of this underfunded system—local taxpayers are too! This year, 75% of local school districts intend to raise property taxes to fill the gap from a diminished state share. Amazing educational opportunities exist in many public schools across Pennsylvania. They would be available to many more students if schools had enough resources. In PA Schools Work, we celebrate the many successes achieved in public schools every day. They show that investing in schools will produce tremendous returns for our students and our communities. That’s why we’re working to make sure schools get the funding they need so all students have access to the same opportunities for excellence. Pennsylvania schools work – for students, communities and the economy – when adequate resources are available to give all students an equal opportunity to succeed. 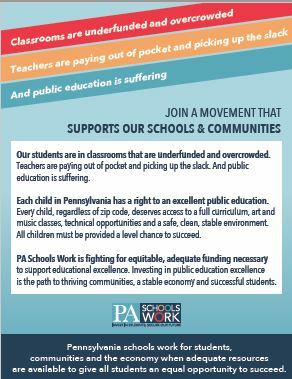 PA Schools Work is a coalition of organizations from across Pennsylvania representing teachers and other educators; urban, suburban and rural communities; and parents and other community members working together to advocate for PA public schools, their students and the communities they serve. Their mission is to ensure that every child, regardless of their background or where they live, is attending a public school that has the funds necessary to help them succeed. 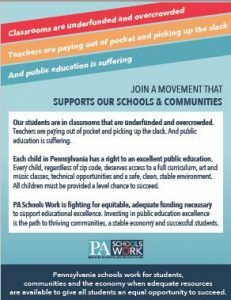 Nine recent fact based research reports on PA’s woeful funding situation are at http://paschoolswork.org/research/. An additional report just released January 10, 2019. 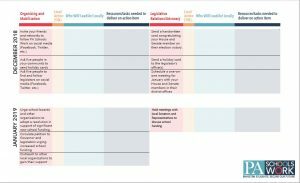 Skilled Workers Needed: Ensuring Investments in Career and Technical Education Report and References. 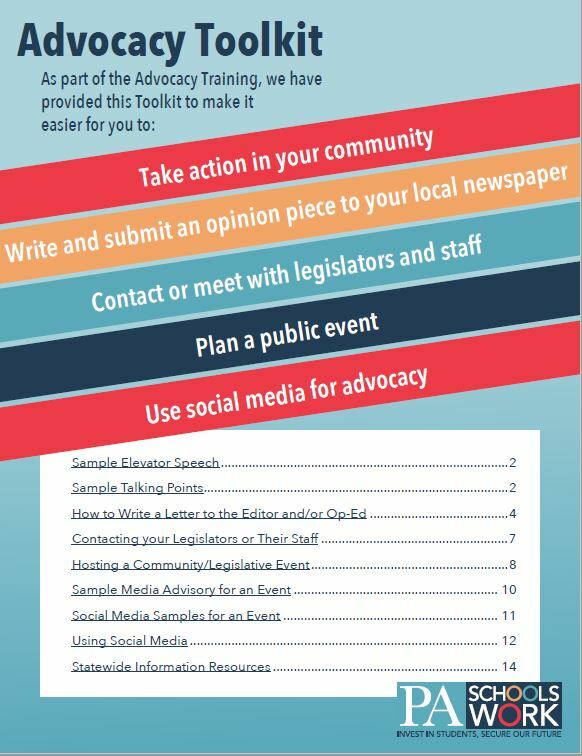 Consistently and constantly include information in branch newsletter and at branch meetings through June 2019. 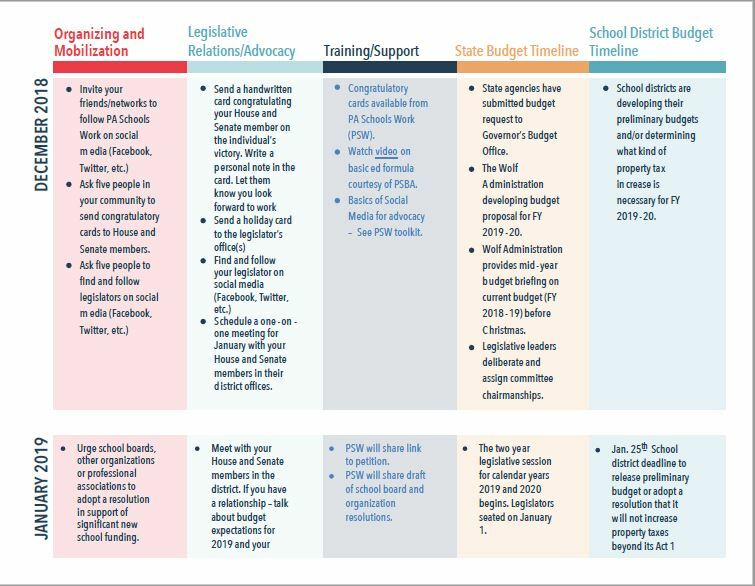 You may find this Introduction to PA Schools Work, created by the AAUW Pennsylvania Education Committee, helpful. State College newsletter article here. 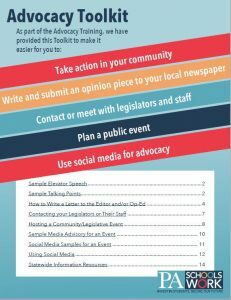 Do as AAUW so you can discuss all AAUW issues. 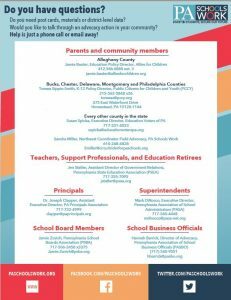 Include PA Schools Work as one of the issues presented. Must develop an AAUW relationship with Pennsylvania Representative early in General Assembly so we can “trade” on it for our issues. Reach out to local PA Schools Work people to get connected with local events/activities. Participate in at least one.